When the mainstream cars started to dive in the market because of improved opposition, Allard turned to an 'economy' model using the Ford Consul (21C) or Zephyr (21Z) engines. They were smaller (96in wheelbase) versions of the K3 (without the de Dion axle) but the loss of size equated to loss of presence. 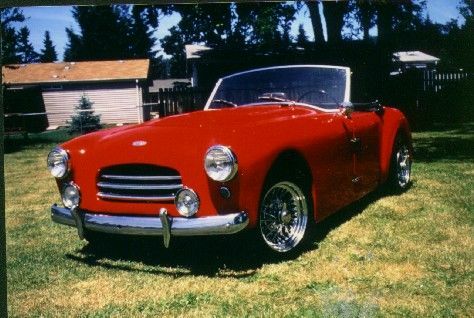 The Consul-engined version, in particular, was a dog: it was feeble, undistinguished and expensive for what it was, the wonder is that eight people were daft enough to buy one when they could have had the infinitely superior TR2 for less outlay. 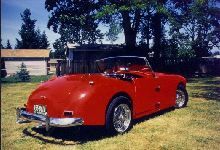 The Zephyr-engined car was better, but it is difficult to think of a single reason for buying one in preference to an Austin-Healey 100 which cost about the same. 8' 0" 4' 3" 13' 0" 4' 10"